Sarah is an honours law graduate of University College Dublin. 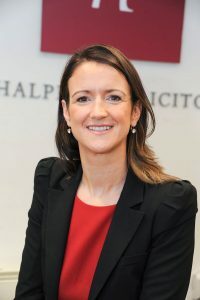 She practiced as a solicitor for a number of years in a commercial law firm before founding Halpin & Co. Solicitors in 2009. Sarah regularly lectures in The Rubicon Centre in C.I.T. to entrepreneurs on legal issues for S.M.E’s and also lectures to the Munster Institute of Certified Public Accountants. She advises businesses and individuals on various areas of the law. Sarah is committed to legal education and was awarded her second diploma in 2014 by the Law Society of Ireland in Employment Law. 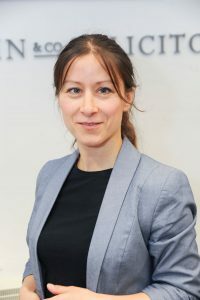 Sarah has developed a reputation in commercial property and employment law acting in both contentious and non-contentious matters. Sarah’s goal is to achieve the best possible outcome for you in your personal and business affairs. She adopts a practical approach to problem solving and her focus is always solution driven. Sarah was delighted to be presented with a medal from F.L.A.C. (The Free Legal Advice Centre) this year for her long service and commitment to the Centre in Cork where she has been a volunteer since she founded the firm. Sarah also works with the Public Interest Law Alliance (P.I.L.A.) whose remit is to assist marginalised and disadvantaged individuals. Sarah would be delighted to assist you with your query, call her on 021 4251843. Majella trained as a solicitor with a general solicitors’ practice in Cork City before moving to an in-house position with the Health and Safety Authority in 2008. Majella dealt with all aspects of the Authority’s legal work. Majella is also qualified to practice as a solicitor in England and Wales. Majella returned to Cork and to general practice in 2016, she has a keen interest in conveyancing and personal injuries litigation. Majella uses the expertise she gained whilst working in the Health and Safety Authority to assist individuals with personal injuries actions. Majella also assists companies in the development of their workplace safety practices and provides advice and assistance to employers dealing with a health and safety prosecution. Majella would be delighted to assist you with your query, call her on 021 – 4251843. 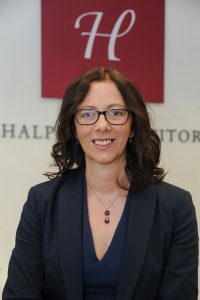 Isabel is the office manager with Halpin & Co. Solicitors. She has a degree in Social Work from Neubrandenburg University of Applied Sciences and was a social worker in her native Germany. On moving to Ireland she re-trained as a legal secretary and has been an integral part of the team in Halpin & Co. Solicitors for the last number of years.